The 9th Hot Rod Hayride, held just south of London at the end of July, has become a real must-do event if you’re into traditional hot rods, cool bikes, 40s-50s music/clothing/stuff, or any one of the above, really. For us, it’s just about meeting our buddies, hanging out, checking everything out and taking some well-earned R & R soaking up the unique laid-back vibe. 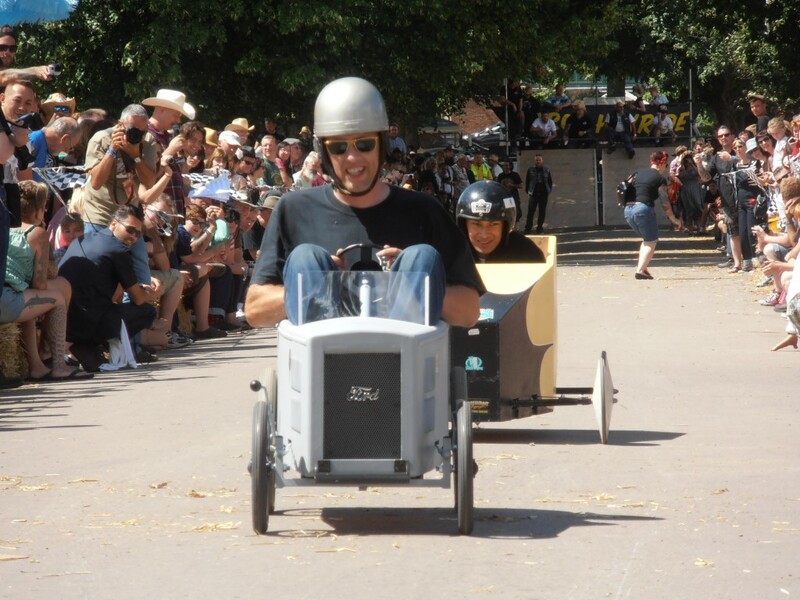 With the live music, the Hayride Hill Climb, Wall of Death riders, Art Show, Burlesque, Flea Market & Autojumble, the Stromberg Soapbox Derby and, new for this year, Roller Derby (! ), there’s plenty to keep you out of the bar. And it’s a formula that seems to work year in, year out. The location is cool. Even the fact that ticket numbers are limited – this year was a sell out – with no day passes, adds to the atmosphere. It’s participation only and folks now come in from all over Europe. Does it sound like we had a great time? You bet. Thanks to Jerry, Anna, Andy, the Detonators CC and everyone else who makes it such a great weekend. Congrats to the fastest Soap Boxer who won a pair of new 97s. Enjoy the pictures! Remember our awesome 4th July red, white and blue Stromberg 97 carbs? Sold to Eric Arnette from Texas via our Facebook auction, we raised $900 for the Fisher House Foundation and paid the donation today. 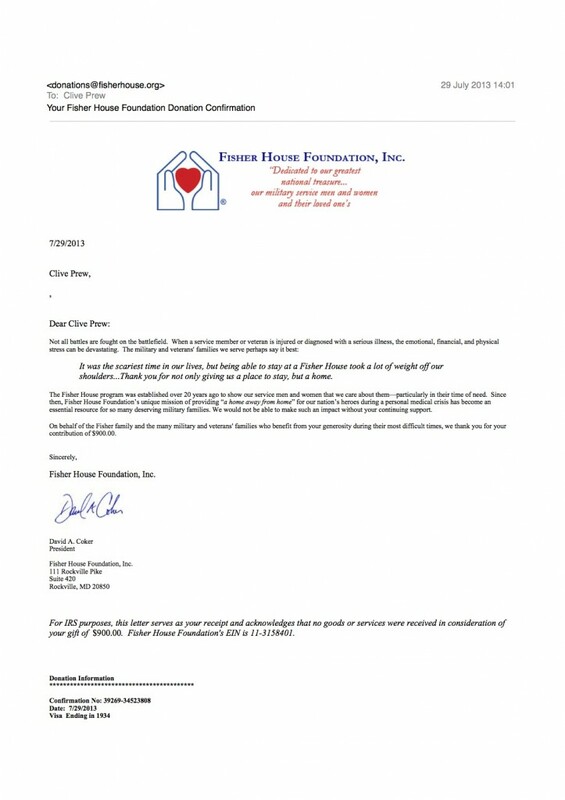 Here’s the letter of thanks from David A Coker, President of the Foundation. I’ve gotta show you this. Canadian Robert West makes the coolest custom jewellery known to man. 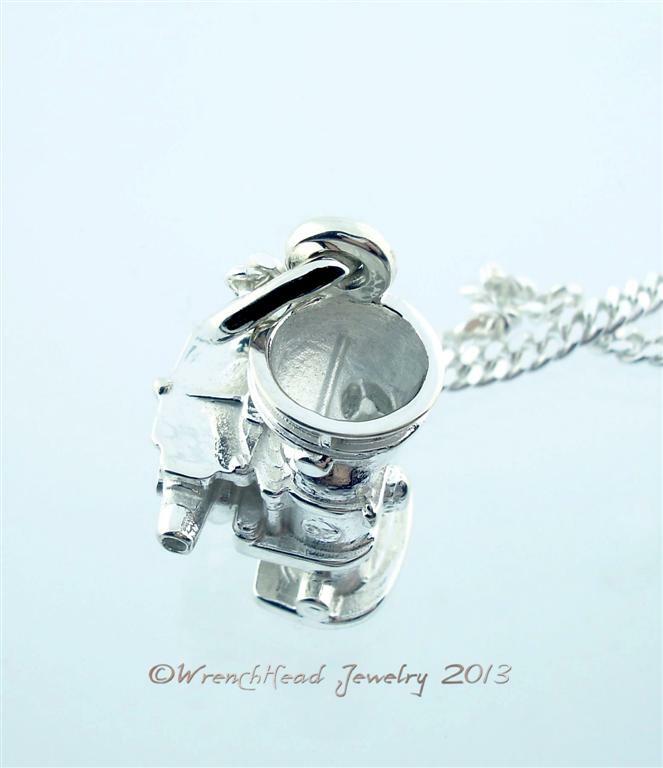 As you can see on his website, his company, Wrenchhead Jewelry is aimed right at the hot rod and kustom lifestyle with awesome rings and pendants – a ’32 roadster (! ), a ’32 grille shell, a striping brush, airbrush, tattoo gun, mag wheel, front engined dragster (honest!) and more, plus a bunch of more traditional jewellery too. And all in Silver, 14kt and 18kt Yellow and White Gold as well as Platinum.But naturally our fave is the half-ounce (18 grams) Argentium Sterling Silver Stromberg 97 carburetor pendant! I mean, it’s 1-1/4″ high and 1/2″ wide! The attention to detail is incredible. And we know because we look at the real thing every day. The proportions are perfect and you can identify the screws, the choke plate, the bowl plugs, the S-jet inlet valve, even the tiny 97 on the side. And that’s only about 1/32 inch tall! It’s like he’s sent a real 97 off to Revell for miniaturization! Rest assured this stuff is seriously hand made by Robert personally. The Sterling Silver he uses has an anti-tarnish quality that’s a by product of a small amount of Germanium used as part of the alloy. The price? Just $399.00 CAD (Canadian Dollars), including the 22″ Italian-made curb link chain, an upgraded lobster clasp and free shipping to Canada, US., UK. and Australia. Check out the online store (click here) and order yourself an heirloom today! 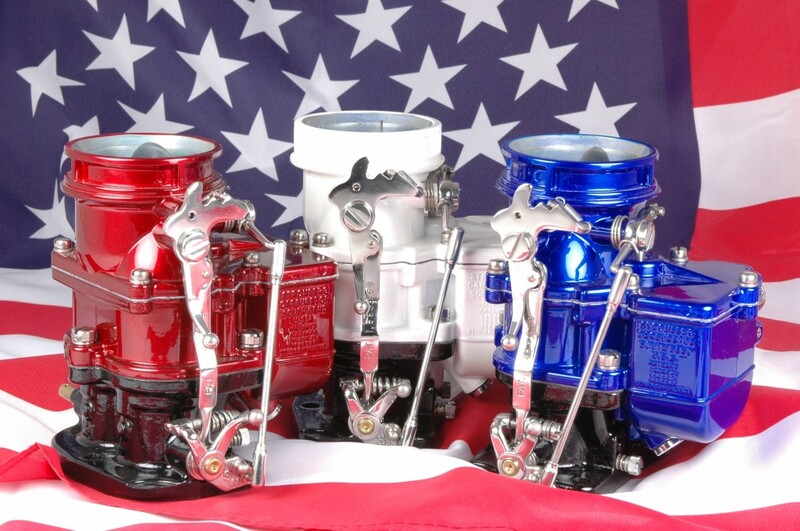 Happy Fourth of July from Stromberg Carburetor ! It was Rick’s idea. Paint some new 97 carburetors in red, white and blue – with all polished/chrome parts – to celebrate 4th July with our American friends. We’ve done Black and Chevy Orange before, but when these babies turned up from our buddies at The Paintbox in three House of Color Pearl shades, we just about exploded with excitement. Out came the flag and, well, here’s the result. Our next idea is a little more serious. How about we auction these carbs through our Facebook Page and give all the money to a US Veteran’s Charity? Sounds good? Simply click onto our Facebook Page www.facebook.com/stromberg97 on 4th July and add a comment to make a bid. Auction starts now. Ends midnight 11th July. They start at $100 – inc shipping. And there is no reserve. Winner takes all. Dig deep guys. It’s a worthy cause. One more thing. We’ve never hidden the fact that we’re not ‘born in the USA’ here at Stromberg (though Rick’s a US citizen). We’re not exactly related to old King George either. So we make no excuse for celebrating Fourth of July with all our American friends. 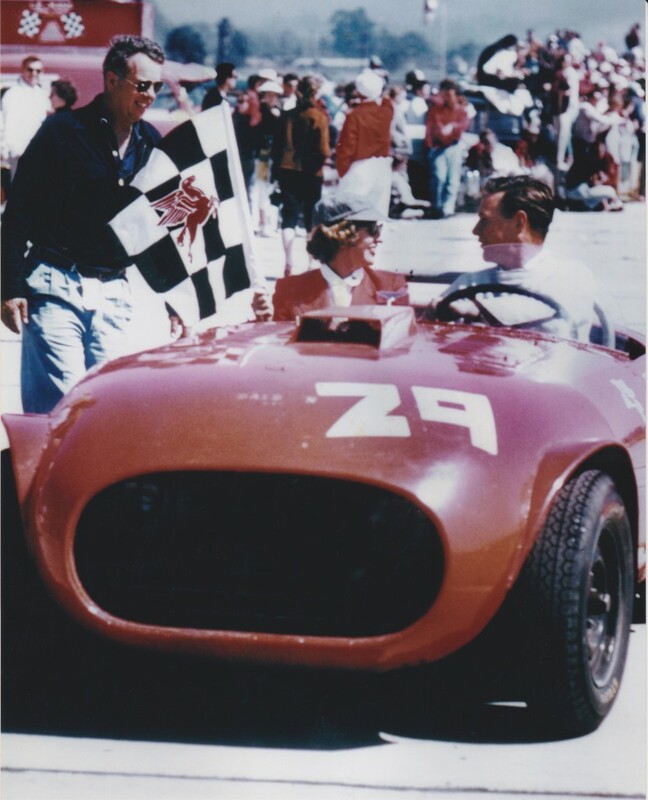 You guys have played a huge part in helping Stromberg Carburetor get where we are today and we appreciate it big time. Have a great day!